It seems that the fair weather is here to stay. This pleasant warmth announces the return of one of my favorite fruits (and I don't have many): cherries. On the other hand, at home salmorejos and gazpachos are essential items when the weather gets too hot. There is nothing better than sipping one of these refreshing soups on the terrace, watching the blackbirds and... almost touching nirvana with my fingertips. And you'll be wondering by now, what do cold soups, heat and cherries have in common? 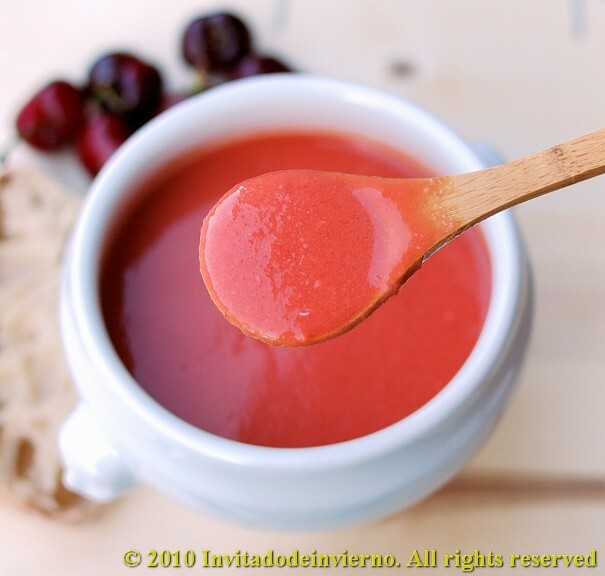 Mmm, that in order to add a colorful note to our grey and monotonous lives, and use the first cherries that I found on the market, I decided to try this daring variation of gazpacho, with cherries of course, from the famous Basque chef Martin Berasategui. Pit the cherries, cut all the ingredients in chunks, place in a large bowl and leave overnight, except the vinegar and salt. The next day, process everything together in a food processor (Thermomix in my case, of course), and put it through a fine sieve if you don't like it chunky. Refrigerate for a couple of hours at least, as it's better served well cooled. The cherries tame and sweeten the somewhat fiery flavor of traditional gazpacho... and give it such a beautiful color... that I'd love to put it in a frame... none of those so very contemporary artists has invented liquid art? So much for this art, damn it. I take this opportunity to share some images from my garden. Everything's bloomed all at once, hardly noticed... and this year we had almost forgotten how flowers looked like! Have a happy warm weather, everyone. Fabulous use of cherries in season now! The colors of your food and photos just keep getting more and more intense. 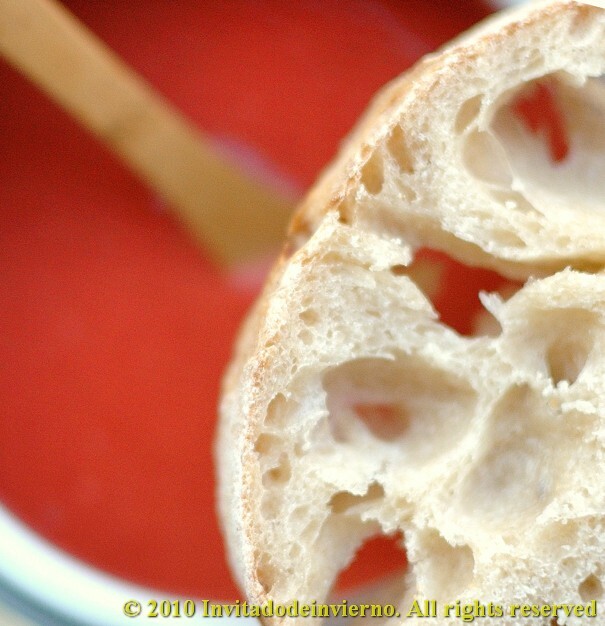 Hypnotically so - and the addition of cherries to the gazpacho is inspired. This looks and sounds delicious as cherries are one of my favorites! We used to have a cherry tree and I so miss making so many dishes using them. Thanks for the recipe! Interesting recipe,Very original and it looks delicious. Wow, this sounds fantastic! Are these sweet or sour cherries? Your recipes and photos never fail to amaze me! This looks delicious! I love fruit based gazpacho! 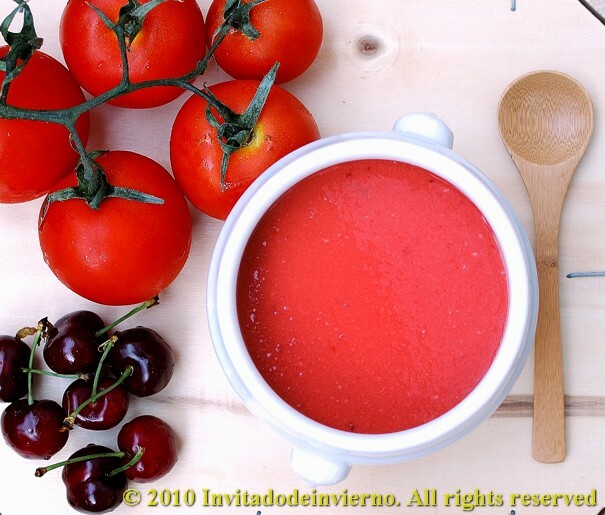 I made a watermelon one that was delicious, now your version with cherries is delightful, gorgeous pictures and the color of the gazpacho is incredible! I think I will have to try this one! I can't wait for cherry season now. This recipe is AMAZING! Tomatoes and cherries???? Who knew?! I can't even imagine these two combined into one! Are your cherries sweet? I bet that would complement the sweetness of your tomatoes. Oh my goodness, I am so super impressed. Thanks for the inspiration and your photos are gorgeous! Incredible pictures and a really interesting combination of flavors. I am really curious to try this. Love the bold colour of your gazpacho - I'm determined to try making gazpacho at home this summer, so I might also try this variation with cherries... sounds intriguing! Thank you for sharing the beautiful pictures from your garden as well! Nunca se me hubiera ocurrido ponerle cerezas. Lo probé una vez con fresas en Navacerrada. Such a cheerful and brightly coloured soup! I've only ever had the traditional tomato-based gaspacho, so I'm very intrigued at the idea of switching it up and adding in some cherries... it sounds like an amazingly refreshing hot-weather meal. Absolutely delicious! I love the color! i'm really intrigued by the addition of cherries. REALLY intrigued. we just had traditional gazpacho for dinner the other night. i had forgotten how awesome it is to eat on a hot day. 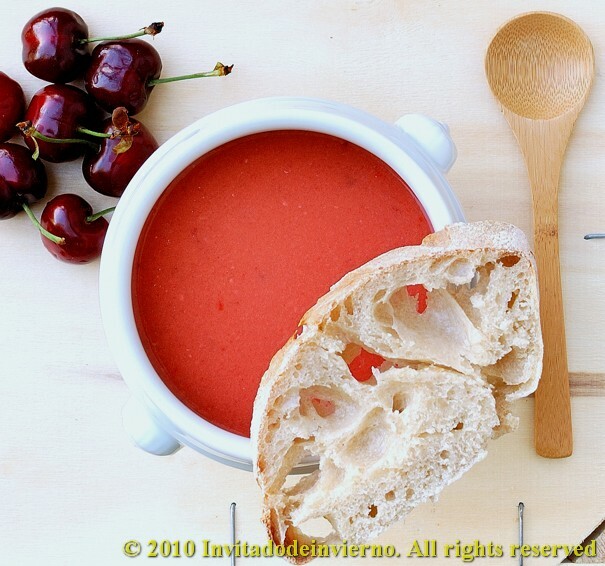 Love the twist of adding cherries to gazpacho and, of course, your photos make it look so temptingly delicious. Oooh the color is just so amazing! Yum! These photos were so beautiful I wanted to see them in a poster format! great recipe Miriam i posted a lebanese gazpacho recipe too but I love your version with cherries it is so original! Pam: oh... I'd loooove to have a cherry tree. 5SF: they are sweet cherries, thanks for the comment. I've corrected the post, because in Spain we simply don't grow sour cherries, therefore cherries alone means always sweet cherries for me! CetV: hope you like it! Val: you must try it! Patty: yes, my cherries are sweet, they're always sweet in Spain. Cristina: jaja, pues ahora ya no tienes excusa... es muy fácil! Mjosé: las frutas lo suavizan y están bien para variar de vez en cuando. GreenGirl: hope you like it as much as me! ToB: I love your recipes too, but I don't have much time to comment!